Rolling Surveillance training is a one week course covering LCI (mobile and foot) surveillance techniques, identifying counter surveillance, and responding to C.S. as a team WITH field exercises. 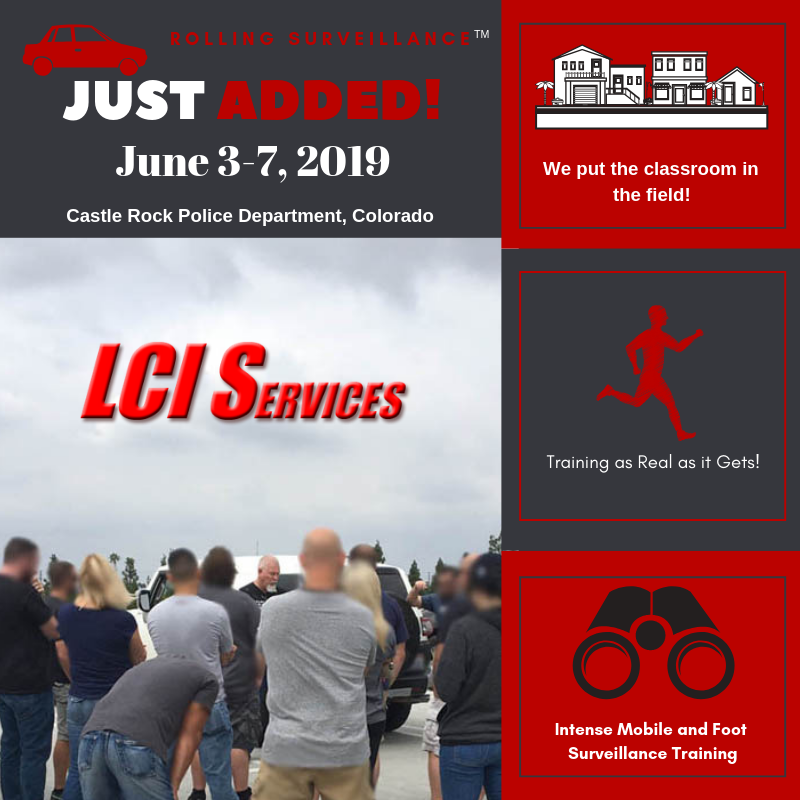 Rolling Surveillance II training is an advanced version of the first week (mobile and foot), with more in depth foot surveillance on public transportation and in airports, etc. “This class was extremely helpful! One of the best classes I’ve ever attended. ~ Ofcr. W. Nickerson, Albuquerque P.D. ~ Det. T. Sullivan, Albuquerque P.D. ~ Det. N. Stamos, Castle Rock P.D. ~ Det. B. Vandermeer, Commerce City P.D. ~ Ofcr. S Gonzales, Visalia P.D. ~ Inv. J. Ceja, Yolo County S.O. ~ Ofcr. J. Jacobs, Aurora P.D. ~ Dep. E. Gard, Jefferson County S.O. ~ Det. J. Roubidoux, Jefferson County S.O. ~ Sgt. P. Esquibel, Visalia P.D. “Very good training, great concepts to apply. ~ Ofcr. II T. Farris – Las Vegas Metro P.D. ~ Ofcr. M. Dardanis – Las Vegas Metro P.D. ~ Det. A. Watkins – North Las Vegas P.D. ~ Det. D. Luckey – Howard County P.D. ~ Cpl. S. Hardesty – Beaumont P.D. ~ Ofcr. T. Bowman – Redmond P.D. ~ Ofcr. J. Jimenez – Palm Springs P.D. ~ Ofcr. II S. Keith – Las Vegas Metro P.D. ~ Ofcr. W. Dolan – Ventura P.D. ~ Det-Cpl. D. Abuelhawa – Howard County P.D. ~ Det. E. Pearson – Phoenix P.D. ~ Ofcr. S. Bryan – North Las Vegas P.D. ~ Ofcr. C. Shibata – Phoenix P.D. ~ Ofcr. J. Hammernick – Phoenix P.D. “The class was taught with real lab application which added tactical learning. ~ S.A. B. Maldonado – D.L.A. ~ Ofcr. A. Grove – Kent P.D. ~ Det. J. Steele – Longmont P.D. ~ Det. M. Fortune – Phoenix P.D. ~ No name – Las Vegas Metro P.D. ~ Ofcr. R. Rossmeier – Kent P.D. ~ Det. B. Tseng – Federal Way P.D. ~ Cpl. G. Walter – Beaumont P.D. ~ Det. C. Hawyer – Burbank P.D. ~ Det. C. Saunter – Lake Havasu P.D. ~ Ofcr. R. Lamberto – Phoenix P.D. ~ Det. C. Morris – Phoenix P.D. “The training was non-stop / to the second – you had no choice; but to learn. This class was great. I enjoyed the instructor’s honesty throughout the class / course. ~ Det. W. Giblin – Las Vegas Metro P.D. ~ Ofcr. R. Leung – Las Vegas Metro P.D. ~ Ofcr. D. Forbes – Carlin P.D. ~ Ofcr. II M. Graces – Las Vegas Metro P.D. ~ Ofcr. II C. Gorrell – Las Vegas Metro P.D.